Lawyers are embracing technology that makes them more efficient and less trapped in 100-hour work weeks but that also reduces the need for them in certain types of cases or turns their counsel into a commodity. These technologies and services include a Web platform that searches patents more quickly than lawyers can, an app to find flaws in contracts, low-cost access to ask legal questions and an arbitration network to keep from having to hire legal representation to go to small-claims court. Attorneys from across the country heard about these at the recent LegalTech conference where some of the attendees indicated that the innovations could save money for law firms and even change their hiring practices by cutting the need for full-timers. One attorney joked that the innovations are disrupting the profession so much that he’ll be retiring early. Hooking up lawyers with individual clients via the Web to do legal work is offered by more than one company, undercutting traditional prices and giving attorneys the chance to work at home. Many attorneys say they are tired of the grind at law firms and prefer to work fewer hours out of their homes. Here are nine companies that hawked their wares at LegalTech. The company, Arbi Claims whose motto is “Life’s too short for court,” seeks to replace small-claims court with Web-based arbitration hearings overseen by lawyers. The parties agree to having disputes settled by Arbi Claims via Web-cam sessions where they present their sides. The company has enlisted a stable of lawyers to hear the cases, and it’s not hard to find them, says company founder Stephen Kane. “What lawyer doesn’t want to be a judge?” he says. The limit on cash value of the claims is $10,000 and the price the parties pay is between $79 and $159 each. A sticking point is getting defendants to agree to the arbitration, so the party making the complaint actually does have to make a filing in small-claims court first in order to get their opponent to agree to arbitration, he says. Some online businesses offer resolution of disputes between customers on their sites, but Arbi Claims plays in a broader field. Kane says the company is looking at handling parking-ticket challenges, a potentially huge market. But another company called Fixed App, is already specializing in parking tickets and has been funded by investors on the Shark Tank TV show. 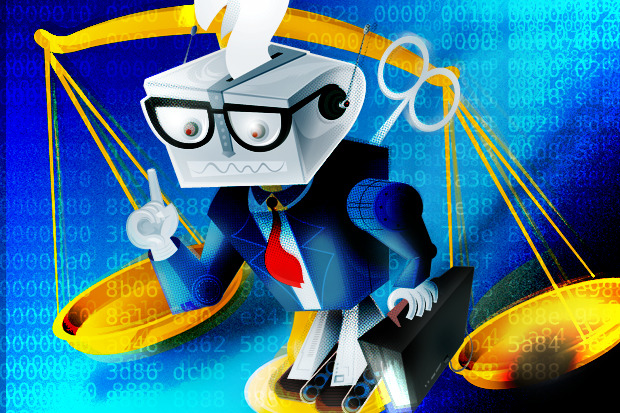 Attorneys write contracts in legalese that often requires hiring other attorneys in order to understand the meaning, but Legal Robots is enlisting artificial intelligence to parse the language so mere mortals can understand the terms of agreements. An algorithm that analyzes the text looks for logical inconsistencies, terms defined but not used, and language that could be simplified or made less ambiguous. The platform employs neural networks and machine learning to refine its analysis. It was trained by consuming public and private legal documents to identify discrepancies statistically among elements common across documents, says CEO Dan Rubins. Customers get a mobile app, upload a photo or file or send an email containing the agreement and get a breakdown of the legal language. The cloud-based service sorts out the rights and privileges outlined in the document, and uncovers provisions that might be buried in the “miscellaneous” sections, he says. For $15 per document, the service can be used to prep clients before they speak to their own attorneys about contracts as a way to shorten those sessions and to help focus them on issues of most concern, he says. Lawyers could also use it to look for inadvertent weaknesses in their own work. Rubins says he thinks attorneys will test the system out by purposely dropping suspect phrasing into documents and seeing whether Legal Robots can find it. Fending off patent trolls can be a lot easier with technology from ClearstoneIP, which quickly sorts through its database of patents to find those that a company’s new product might violate. Rather than a lawyer spending weeks rabbit hunting through decades of records, the company’s online platform called Element can do it 30 to 40 minutes, says COO Gabe Sukman. That includes a full analysis of why a patents might stand in the way of new products, he says. The primary use would be to reduce the risk of being blindsided by patent holders who claim a new product makes use of their protected intellectual property, he says. The cloud-based analysis platform eliminates unrelated patents then deduces what patents are most important and highlights them. It links concepts expressed within patents that might infringe. The platform can be run continuously to look for potential conflicts that might arise with newly filed patents and with upgrades to existing products that might add patented technology, he says. Casetext is an online service that provides a Web platform for composing legal documents that makes it easy to display relevant supporting materials and citations to the side of the screen where they can be drag-and-dropped into the document being written. It also offers a database of annotated cases that can be used to speed the analysis of prior law by providing references to related cases and commentary about them. Using data science and crowd sourcing Casetext offers researchers a place to search for how legal decisions have informed other decisions, a big part in preparing arguments for ongoing cases. Casetext is using crowd sourcing to create a database to explain the relationship between different cases by explaining the differences between a court decision and an earlier case that the judge cites in it. This work is being done by law students at 150 schools who read the cases and write up the analysis of their relationship in return for prizes that range from gift certificates to parties for their entire law schools. So far the company’s database has a library of 250,000 such relationships, says Casetext CEO Jake Heller. For those who want to publish legal analysis, the site will post it and record comments left by readers, he says. Articles can be submitted to readers at Casetext for consideration to be featured on the site if they pass muster. Small firms and associates at larger law firms could use this database for free research as well as law students working on assignments. The site offers a database of U.S. Supreme Court cases and cases from larger sates as well as of statutes, rules and regulations. Attorneys tired of the 100-hour work week rat race can sign up to do freelance lawyering with attorney-on-demand service Hire and Esquire. Work-at-home technology allows them the flexibility to perform tasks as needed without having to commit to the full demands of a law practice. Hire an Esquire has found 5,000 lawyers willing to be included among the company’s labor pool – or rather they found Hire an Esquire, says the company’s COO Jules Miller. The customers could be individuals seeking legal help or firms that need someone to work on a particular case, she says. The company takes on filling out tax paperwork for the companies that hire the part-timers. A back-end sorts and ranks the attorneys, tracks their performance and client evaluations. The company offers training and coaching to attorneys who fall short. Law firms using the service could save money by hiring fewer, more expensive full-timers, resulting in smaller firms that need less office space. The firms pay less and the part-timers can get paid more at the same time, partly because it has attorneys in places including Nashville and Alabama where lawyers get paid less than at top firms in big cities, Miller says. So they could be paid more than they would earn locally but more than they would in a major legal market. A logic engine sits behind SmartContract’s service, which links legal conditions in contracts to other automated services that carry out contractual obligations once certain conditions are met. The big use case: delivering payments in business verticals where fraud is common. An example: shipping. When a ship’s cargo is certified to the service as delivered to its destination, that triggers an automatic digital payment, says Sergey Nazarov, the company’s CEO. The service forces clarity into contracts because it requires plain if-then statements that both parties agree on, he says. That makes the contract tamper-proof, because there’s no way a single party can back out of the agreements; they are carried out unless both parties agree to a change. It also makes the contracts injunction proof. One party can’t go to a judge and get an order to delay a payment because the payment is set in motion automatically. The company uses servers that are geographically distributed so neither party can affect the platform itself, Nazarov says. A collaboration tool and tracking application, Concord can reduce the time it takes legal teams to create documents and ensure their progress is tracked. The platform is “the Slack of contracts” says the company’s CEO Matt Lhomeau. The basic service is free, allowing lawyers to work on contracts together as they are being negotiated, written, signed and executed. It even triggers alerts about pending deadlines within the contracts. Some of the more advanced features such as workflow automation and integration with other legal platforms range from $25 to $100 per user per month, he says. Concord lets attorneys work on documents together and chat within the application about their concerns, replacing emails back and forth or phone calls, he says. The platform is a cloud service, and documents created in it can be exported. He says Concord doesn’t have access to the contracts themselves. Users can create different versions of documents, such as for internal use only or read-only. Frag-einen-anwalt, German for Ask A Lawyer, is making plans to expand throughout Europe and into the U.S., giving low-cost legal advice. The company already offers up do-it-yourself legal advice in Germany and provides access to attorneys online, providing answers to initial legal questions within 40 minutes for $60. The answers are posted with personally identifiable information redacted, so any visitor can read them and possibly find what they are looking for without having to pay for the question, says Michael Friedman, the company’s managing director. He says the site gets 2.5 million visits per month and has posted 160,000 legal answers for searching, much like a legal wiki. The company is working on a legal-project management tool, and seeking funding to speed up its expansion, he says. So far the company gives advice to individuals but has plans to get into corporate law as well. Users can rate the advice they get and the company takes that into consideration when deciding whether to continue using particular lawyers. The company makes money by taking 1.5 percent of the gross revenues as a technical fee, but has figured out how to boost that to 20% to 25%, Friedman says. Attorneys are obligated to review the answers they have given and posted once a year to make sure they are still accurate. Other attorneys using the service can weigh in on whether answers given are accurate as well. Answers are flagged in red if they are more than two years old and still not reviewed. Lone attorneys and non-profit legal services groups can buy Legal.io’s legal network in a box platform to offer more efficient services to low-income clients. The software platform includes a phone app that lets clients tap into legal resources and enter information about their cases to streamline intake and help triage which cases are most urgent, says CEO Tony Lai. The attorneys have access to a dashboard that tracks their cases and allows them to give real-time feedback to client’s questions. Legal aid organizations set up to help low-income people wind up turning away thousands who don’t meet their income requirements and are referred to other firms. Legal.io can help those firms and individual attorneys work more efficiently and so charge less, he says.